[Plugin] Extended Standard Views - ArchTools-version! My variant of script of published before Chris Fullmer. A difference is more correct code, to my mind. It is the cut out part from my complex of plugins. Re: [Plugin] Extended Standard Views - ArchTools-version! You can use JHS standard toolbar 2017, it is fixed. It's working flawlessly in Sketchup 2017 ! 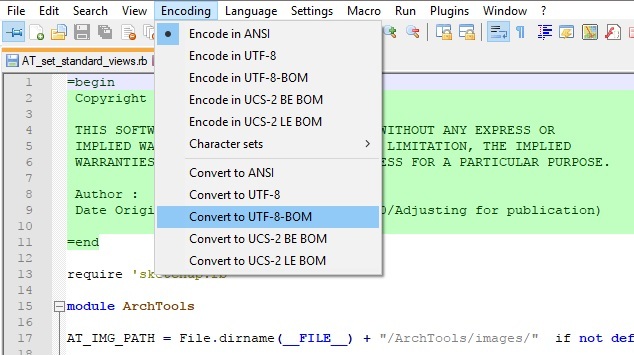 You will have to convert the script file AT_set_standard_views.rb to UTF-8-BOM (without BOM) first, otherwise it won't load properly in 2017. How to do such a thing ? 1. Unzip the AT_set_standard_views.zip archive (link above in AlexM's post. Registration is free in case you are not registered). 2. Open the freeware editor Notepad++ and download it if you don't have it. 3. Load AT_set_standard_views.rb go to menu "Encoding" and click "Convert to UTF-8-BOM (whithout BOM)." There is a slight unzoom factor of .95 line 59. I turned mine back to 1 (without AlexM's permission...). 4. Put the new saved file with its folder "ArchTools" into your sketchup 2017 Plugins directory %appdata%\SketchUp\SketchUp 2017\SketchUp\Plugins. Copy and paste this blue text in your Explorer Address Bar if you don't know where to find it. Reload Sketchup 2017 and enjoy your new extension. There is an AT view submenu in the "Camera" menu and a nice toolbar shown in AlexM's post. Many thanks to AlexM ! MANY THANKS! to AlexMozg for the Extended Standard Views! AND to babak for instructions on installing it in SU 2017! I became dependent on Chris Fullmer's version but lost it with SU 2017. My arrow keys are shortcuts to it. BTW I tried changing the scale to 1, but that didn't work for me. I imagine it has to be formatted as 1.0 or something. This is a GREAT plug in! By the way the only way I know to install it is to copy the AT_set_standard_views.rb file to the Plugins folder.